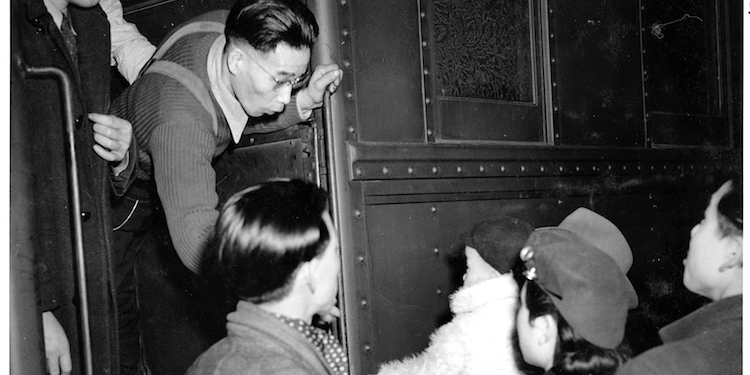 A man looking down at a baby in a woman’s arms in 1942, when Japanese men left via train to eastern destinations in Canada. The play, “The Tashme Project,” is 100 hours of interviews boiled down to 75 minutes of very personal theatre. That’s what happens when two members of the theatre world—Julie Tamiko Manning and Matt Miwa—find out that the Japanese half of their heritage includes family members who were interned at the same camp, Tashme, during the Second World War. It was the largest internment camp with an estimated 2,000 people living there. The federal government is now funding a memorial site in Tashme, located halfway between Hope and the western edge of Manning Park. Focusing on the oral histories of Nisei—the second-generation Canadians of Japanese ancestry born in Canada—“The Tashme Project: The Living Archives” gives Manning and Miwa a myriad of opportunities to embody many people, through changes in their body language and voice. They become the people of the rapidly dying-away cohort, the last who still remember losing it all, packing what little they could into a tiny suitcase and restarting their lives in what other countries call concentration camps. Canada still calls them internment camps. For most of the people in Tashme in 1942, it meant saying goodbye to husbands and sons who were sent elsewhere, often as human machines on road crews, living in shacks—not free—chain gangs without the literal chains. It was a particularly cold spring when everyone left, according to Environment Canada. Too cold to be living in tar-paper shacks with no running water or indoor plumbing. Too cold to leave high school, elementary school, businesses, fishing boats and comfortable lives in comfortable homes. Some of those homes they left still stand in Steveston today. The theatre company that put this creation together, Tashme Productions, started their cross-country tour in central Canada and has now made its way to the Firehall Arts Centre in the Downtown Eastside of Vancouver, near the Powell Street neighbourhood that was Vancouver’s Japanese community. It was a fitting location but would be equally so in Steveston where 10 per cent of all Japanese-ancestry Canadians lived prior to the expulsion. The staging of this play appears simple yet offers sophisticated options. What looks like hanging scrolls in the background turn out to be ever-changing screens that, at times, offer photos of young women before internment while, at other times, we see smoke gently wafting in the background. Behind the scroll screens, are mirrors that subtly reflect the backdrop. The lighting is spot-on though some of the blue lights on the floor on the sides of the stage glared a little for the audience. The background sound is almost unnoticeable, like a gentle addition of truffle oil; it enhances everything without being tasted itself. A word of warning, offered at the box office, is to go a little early, use the washroom and watch the show in comfort. There is no intermission. It is worth staying after for the brief question and answer period. New stories come out. Backgrounds are filled in with compassion and heart-felt accuracy. The sight lines at the Firehall Theatre are excellent. Audience members can comfortably see and hear from any seat in the house. Her mother went on to recount the story that, as they were leaving, the moms of new babies put their infants into the arms of Canadians who were not being sent away, so their children could be raised in freedom. These family secrets need to be out in the light. Not to pick at old sores but to teach us what happens when we are convinced an identifiable group amongst us is other than fully human, that a whole ancestry of people is dangerous, people who can be treated as less than we would treat our fellow humans. Through their interviews, “The Tashme Project” helps us all remember what we should never forget. “The Tashme Project: The Living Archives” runs at the Firehall Arts Centre, 280 E Cordova St, Vancouver through April 13. It appeals to both those with Japanese ancestry and those without. It is more than a good evening’s skilled theatre, it is engrossing and important. phone 604.689.0926 or e-mail here.